Dodatna oprema Teknamotor offers complete solutions for belt and vibratory systems of loading and transportation of chips. Ostale informacije The vibrating table is designed to cooperate with vibrating and belt conveyors, and to store large quantities of charge material, for example the kind meant for loading with a frontal loader or a fork-lift truck. The table consists of a metal box joint to a support frame with spring elements. The vibrating table is driven by an electric motor through the eccentric system. Low power consumption of the eccentric system results from the resonance principle of work of the table. Depending on local conditions, the table is set on a support frame fixed on a foundation. Material from the vibrating table is dosed onto a vibrating or belt feeder. 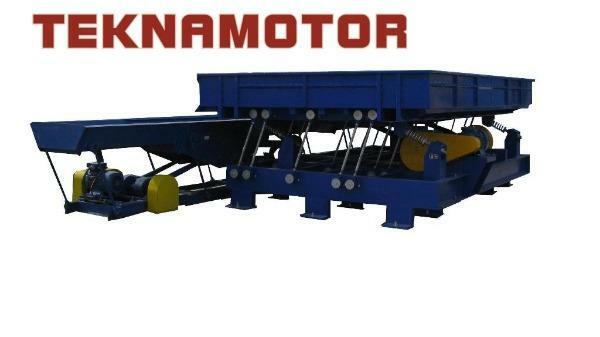 Synchronization of work of the vibrating table and the vibrating or belt feeder allows continuous material supply to a chipper. Our offer includes loading vibrating tables with dimensions of 2x3, 3x3, 4x3 and 5x3 meters, driven by engines of 5.5 kW - 11 kW power.